Show me something in red, white and blue and I immediately think of summer. Warm evenings outside with family and friends. Twigs snapping in a bonfire. Roasted marshmallows. Shorts and T-shirts. And most of all.. laughing and feeling the stress of the world roll off my shoulders.And this summer, this crochet flag wine cozy is coming along for all the fun! 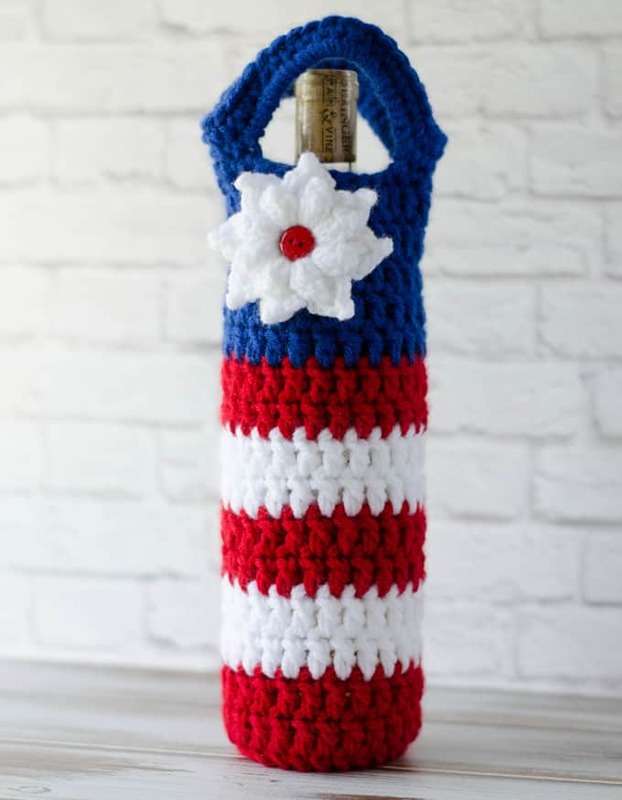 This little cutie combines four of my favorite things: Flags, my favorite wine cozy pattern and my favorite flower design. The 4th? Wine, OF COURSE! One of my favorite things to do is to get together with three of my favorite ladies for a girls night. We bring homemade snacks for dinner and bottles of wine to share. We laugh around the dining room table, catching up on kids, husbands, boyfriends, and anything else that’s best shared amongst good friends. We stay up much too late and laugh until we cry. And when the evening is done, we vow to do it again soon, but with busy lives, months and sometimes seasons pass before we meet again. 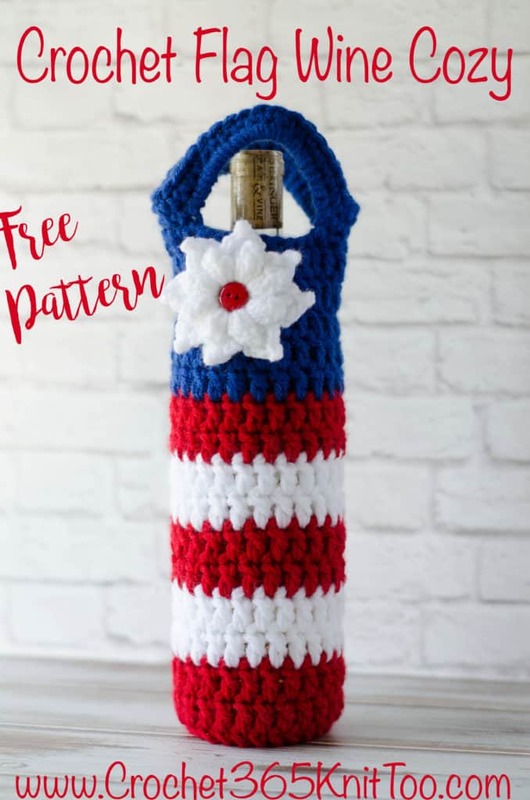 But this summer is looming ahead with all sorts of possibilities and this crochet flag wine cozy is just the perfect thing to take along to the next get together with family or friends. Wine cozy is worked using 2 strands of yarn. I wound a small ball of each color before I started and then used 1 strand from the new ball and 1 strand from the skein. R1: Using 2 strands of red yarn, make a magic ring, chain 3 (counts as 1st dc) 11 dc in ring (12 dc total). Sl St to 1st st.
R3-4: Ch 3 for 1st stitch, dc in remaining stitches (24 st) Sl st to 1st st. Change to White color in joining slip stitch of last round. R5-6: With White and using a double strand of yarn, Ch 3 for 1st stitch, dc in remaining stitches (24 st) Change to red color in joining slip stitch of last round. R7-8: With Red, Ch 3 for 1st stitch, dc in remaining stitches (24 st) Sl st to 1st st. Change to White color in joining slip stitch of last round. R9-10: With White, Ch 3 for 1st stitch, dc in remaining stitches (24 st) Change to red color in joining slip stitch of last round. R11-12: With Red, Ch 3 for 1st stitch, dc in remaining stitches (24 st) Sl st to 1st st. Change to Blue color in joining slip stitch of last round. R13-17: With Blue, Ch 3 for 1st stitch, dc in remaining stitches (24 st) Sl st to 1st st.
R18: Ch 1, sc in same st as joining and next 2 st, ch 14, skip 7 st, sc in next 5 st, ch 14, skip 7 st, sc in last 2 st. Sl st to 1st st.
R20: Ch 1, sc in same st as joining and around row. (42 st). Fasten off and weave in ends. The flower is worked using the Black Eyed Susan Flower Pattern. Use a G size hook and one strand of white yarn. When finished, sew on to wine cozy, referring to photo. Sew button to center of flower. If you loved this Crochet Flag Wine Cozy pattern, be sure to check out the Snowman Wine Cozy, Santa Wine Cozy, Football Wine Cozy and the Fall Wine Cozy. There are lots of fun patterns coming up that you won’t want to miss! Sign up for my weekly newsletter so you won’t miss a thing! I love seeing your finished projects! If you share your Crochet Flag Wine Cozy on Instagram, be sure to tag me @crochet365knittoo. If you are on Facebook, stop over to the Crochet 365 Knit Too Facebook page and share a photo! I’d love to see your work! Written pattern copyright Cheryl Bennett 2018, all rights reserved. Please do not reprint or repost this pattern. 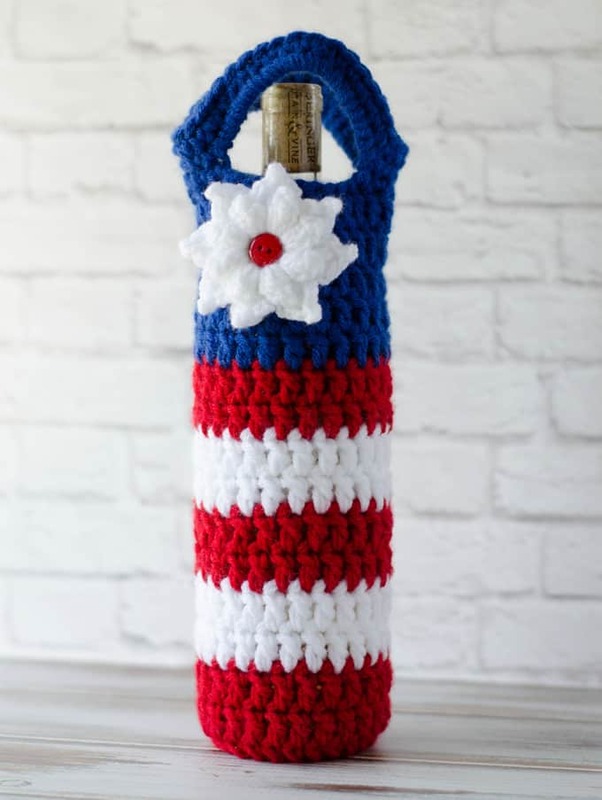 If you would like to share this Crochet Flag Wine Cozy pattern with others, just link to this page. If you’d like to make items for sale from this pattern, please visit my About page for more information. Lovely pattern. Listed it on our blog for American flag cup, mug, bottle cozy.